Flourish with femininity in this electric blue jacquard fit and flare dress. Cut in a smooth scuba bodice and floral skater skirt, this stunning piece features an elegant cold shoulder detail and satin bow fastening. 5 stars worth every penny. This is even nicer than the photo's of it. I don't like cold shoulder dresses tops etc. But I'm really pleased that I sent for this one. I have another dress of this type but bought a few weeks ago. The only difference is. It doesn't have a belt. 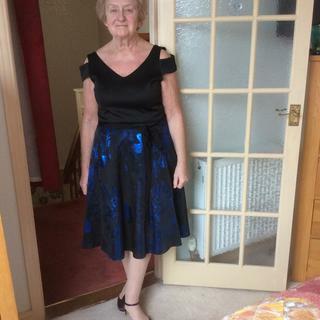 I love this dress, the material is excellent quality and the fitting is flattering for the more shapely ladies, the delivery was excellent too, it arrived quickly as always, thank you Roman I will be purchasing more items from you. This dress is very well made, it came quickly and is just what I was looking for, however it does come in a bit big. I usually wear a size 16 and I was able to go down to a 14 on this as the bodice was not tight enough in a size 16 despite me having a very large chest. It's nice to find a dress tailored so that it fits well but still comes in tight to show off my waist. Its a lovely length I feel I'm 5'8" and falls a couple of inch below my knee and the fit and material are very flattering. When I first got it out of the packaging I thought this wouldnt be for me but it looks gorgeous on. Its too large on me but the next size down is not available. I love it so much that I'm thinking of keeping it and seeing if I can take it in a little. Very pleased with this dress. It fits lovely and is very comfy although looking elegant. As always, excellent service from Roman. LOVED the colour, true to the advert, and the fit. I love my dress, it's very flattering ! I bought it for a wedding i am attending in October and cannot wait to wear it! It will look lovely with accessories I plan to wear along with it ! Thank you Roman Originals, this is the 4th item item I have bought from you and have never been disappointed - yay !!! Bought for a birthday celebration. Lovely dress, The fabric and cut of the dress feels and looks more experience, My husband was genuinely impressed by the dress. It is a great fit. I am size 10-12 and a size 12 fit perfectly. Excellent value at full price to have got it on sale was a real steal. Delivery was very prompt dress fit so beautifully. A lovely dress that fits and looks great will be a pleasure to wear. Great fitting dress, I vary between 12/14 and size 12 very nice fit, slight elasticity in the top which makes it very comfortable to wear. Blue pattern shimmery but not over the top. Look forward to ordering another dress! Yes I got this I the sale its beautiful can't wait to show it off on my cruise love getting glam med up. Excellent fit. Delighted with my purchase. So comfortable to wear. Wearing this now out listening to a band with a navy shrug that also came from roman. Half my wardrobe is from Roman. First time I had bought from Roman, infact I had never heard of this company until a colleague told me she used them to buy dresses for a forthcoming cruise. I was so pleased with purchase, and I’m not easily pleased when it comes to clothes! Quality was much better than I envisaged, material at the bottom of the dress was beautiful. The dress will be used for Blackpool Tower dance weekend and a cruise next January. Already looking on this site to buy another. Fits perfectly and looks fantastic. Correct length and beautiful material on the skirt. Best Buy ever. Now I just need an occasion to look fabulous at. ?? Very pleased with this cold shoulder dress the fit is perfect it doesn't crease and the quality is amazing. I am so pleased with the quality and fit of this dress, which I bought for an upcoming wedding. I’m normally a size 14, but on reading other reviews I decided to order a size 12 and it fits perfectly. The skirt of the dress is lovely and really catches the light. It’s a different style to that I usually wear and I was a bit bothered it might be too young a style. However it looks great and I’m looking forward to wearing it. This is a lovely dress. The fit is perfect, the colours are rich, and I can't wait for the occasion to wear it. Thought it might be a bit young for me, but it suits me fine and I'm glad i got it! Words cant express my delight. Very happy with my dress. Fast delivery and excellent customer service. Perfict fit for my forthcoming cruise. Would strongly recommend this item and roman originals as a whole. I’m really happy with my recent purchase. It fits perfectly and looks great. Now I just need a suitable event to wear it to! Lovely dress !fab prompt delivery too! Dress is a good fit and a beautiful blue in the skirt shimmers as you move too ! The dress arrived on time ,it was true to size.it is very well made with an under skirt, looks as picture. Would recommend this dress, it is not my usual style but I thought I’d try something different, no regrets! Highly recommended. Lovely dress and fit. Very happy with it. Lovely blue color. Great bargain as bought in sale. Lovely dress, great length and fit, love the colour, even better it was in your sale. A very elegant and stylish dress for evening wear or a special occasion. A real 'showstopper' with a beautiful 'metallic' leaf print skirt. Worn on a cruise. I love the dark bodice and shiny blue pattern on the full skirt. Love it! Beautiful dress..I normally struggle with the fit of dresses as I am bigger "up top" but this fits really well as the material has a bit of stretch to it. Very pleased with the overall look of this dress & the electric blue is stunning & really catches the light as you move. Beautiful dress, material good quality. Generous on shoulders and bust. I bought it to wear for dancing with net petlticoat under and it looks fabulous.I also wear broader belt. Lovely for special occasions. I bought this as a last ditched attempt for a wedding. After spending hours trailing round the shops I was desperate. It is gorgeous and lovely quality. What a find. I am so pleased. The only thing I was a bit worried about was the "cold shoulder" look but the overall look more than makes up for that! I love it. I used to shop in Roman, but the shop disappeared - so glad I have found this site! Very nice dress lovely colour fits nice. Nice for party or special occasion. BEST ANSWER:The top of this dress is black. Top of dress is black. BEST ANSWER:Yes this dress will fall past knee length. This dress has a wearing length 92cm depending on size. Yes it will fall below the knee. I'm 5'8" Its a lovely length I feel and the fit and material are very flattering. When I first got it out of the packaging I thought this wouldnt be for me but it looks gorgeous on. Its too large on me but the next size down is not available. I love it so much that I'm thinking of keeping it and seeing if I can take it in a little.